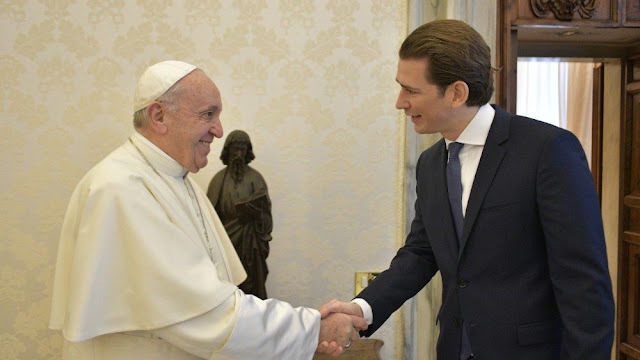 Vatican News Release: Pope Francis meets Austrian Chancellor Kurz At a private audience in the Vatican, Pope Francis and the Austrian Chancellor, Sebastian Kurz, discuss the two countries’ bilateral relations and the importance of the protection of life, the family, and the weakest members of society. Pope Francis on Monday held a private audience with Mr. Sebastian Kurz, Chancellor of the Republic of Austria, in the Vatican Apostolic Palace. A communiqué from the Holy See Press Office said their discussions were “cordial” and that they spoke about “the fruitful collaboration existing between the Holy See and Austria”. The Pope and the Austrian Chancellor also underlined “importance of the protection of life and the family and the promotion of the common good of society, especially with regard to the weakest sectors of the population.” Pope Francis and Mr. Kurz, the press statement said, went on to talk about various current international issues, “including peace, nuclear disarmament, and migration.” Afterwards, Mr. Kurz met with Cardinal Pietro Parolin, Vatican Secretary of State, and Msgr. Antoine Camilleri, under-Secretary for Relations with States.